Strike the Blood III Release Date Announced: Trying to find some news on Strike the Blood Anime next season release date updates? Then have a look at our updated we have mentioned here. Recently at the Dengeki Game Festival 2018 the announcement for Strike the Blood Anime Season 3 Announced. Official sources have declared Cast and Crew of Strike the Blood iii Anime making a start with OVA videos. Director Hideyo Yamaoto will be getting back to direct the Silver Link and Connect and supervising, writing will be taken care by Yoshino. In the event we also came across a promotional video for the Strike the Blood Season 3 Anime. 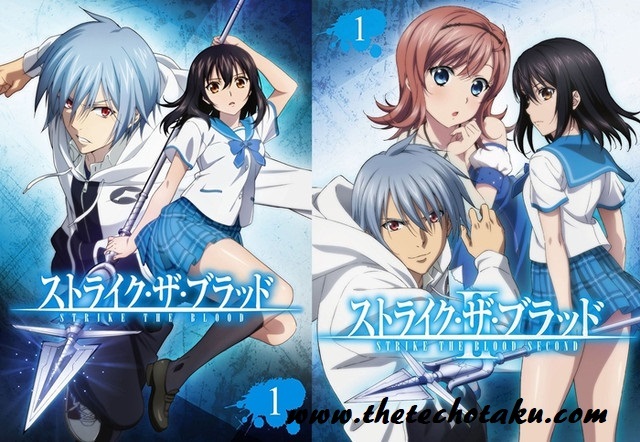 This particular season will cover up to 17 volumes which have been taken from Strike the Blood Manga series. Look at the plot of Strike the Blood Anime which is given below to know what has been done till now and what is going to be expected. It was started from Japanese light novel series of similar name by Gakuto Mikumo. Novel series was illustrated by Manyako and in 2012 it was taken as a Manga series in ASCII Media Works Dengeki Daioh. Later Strike the Blood has moved to get its Anime television series with 24 episodes and followed by an Original video Animation series with title as Strike the Blood ii. Now it the turn for Strike the Blood iii to be released coming year as per the schedule announced in festival. Might you have forgot the plot of Strike the Blood Anime series, so have a look at this short description of story line for Strike the Blood iii Anime. It starts room the adventures of Kojou Akatsuki and high school student being a vampire. He is reluctant in showing his powers and his followed by Yukina Himeragi a teenage sword shaman. Yukina is actually sent to monitor Kojou. This entire picture is from Demon district in city of Itogami. This island is a man made one and having population of monster. Our hero of anime Kojou is suspected to be forth Progenitor who is a powerful vampire. He might get potentially disrupt the power of existing three Progenitors. It is seen that Yukina with Kojou are making friends with monster students and most of them are attracted towards Kojou. Let’s see how the Strike the Blood iii Anime shows the power of Kojou and explore in vampire world. Hope that fans of Strike the Blood Anime Series are waiting for the 3rd season of Strike the Blood. It is expected that Strike the Blood iii will mark an end to the series as it will be using 17th volumes of light novel series. Also it is expected that Strike the Blood Season 3 will bring much thrill then its part two series. Announcement for the Strike the Blood Season 3 Release Date is announced, but it is waiting for an official release date. Stay updated with the latest news on Strike the Blood iii Release Date for us, as we update our article with latest news which is out.